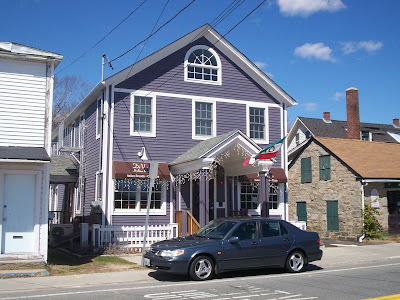 After reading about this bakery on the Internet, and after staring at the beautiful pastries featured on their Web site, Mom and I decided to jump in the car and head for Peace Dale, RI, to visit DiVozzi Italian Bakery. Thank God for the GPS because this place is way out in the country, and not only that, when we had supposedly "reached our destination," we were in front of a pizza parlor. Good thing I spotted this cute purple building on my first trip around the rotary! 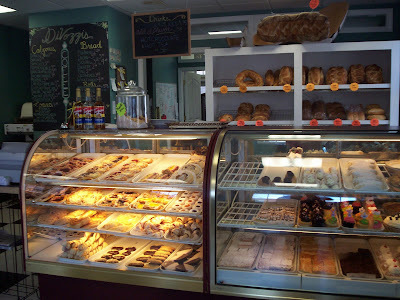 We stopped in at just before 1:30 p.m.
DiVozzi is a small bakery, but each case is filled with pastries, breads, cakes, and calzones. We didn't know what to get, so we decided to get a box of random things. 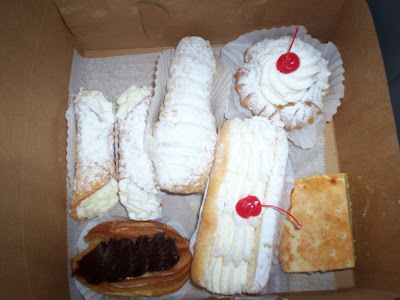 We chose a cream horn for my father, a bismarck, a cream puff, a lemon square, an eclair, and two cannolis for the ride home (all between $1.50-2.75). My total came to $16.20. Mom and I walked through the small dining area and back to the car, where we devoured those cannolis like we hadn't eaten in ... hours. I don't know what this real cream was made with, but it was by far one of the best tasting fillings we've ever had. Mom said that it may have been flavored with vanilla and/or sugar because the sweet taste was very noticeable. The pastry itself was very soft and flaky, and believe it or not, the pastries travelled very well on the ride back home (probably thanks to our cooler packs). Dad loved the cream horn. He hadn't had one in a long time and it was a pleasant after-dinner surprise. The lemon square filling was very tart and flavorful, and the eclair filling was very creamy and sweet. All in all, everything was fantastic, and it was well worth the price and the drive to Peace Dale! For more information, such as the hours of operation, please call (401) 284-4511.